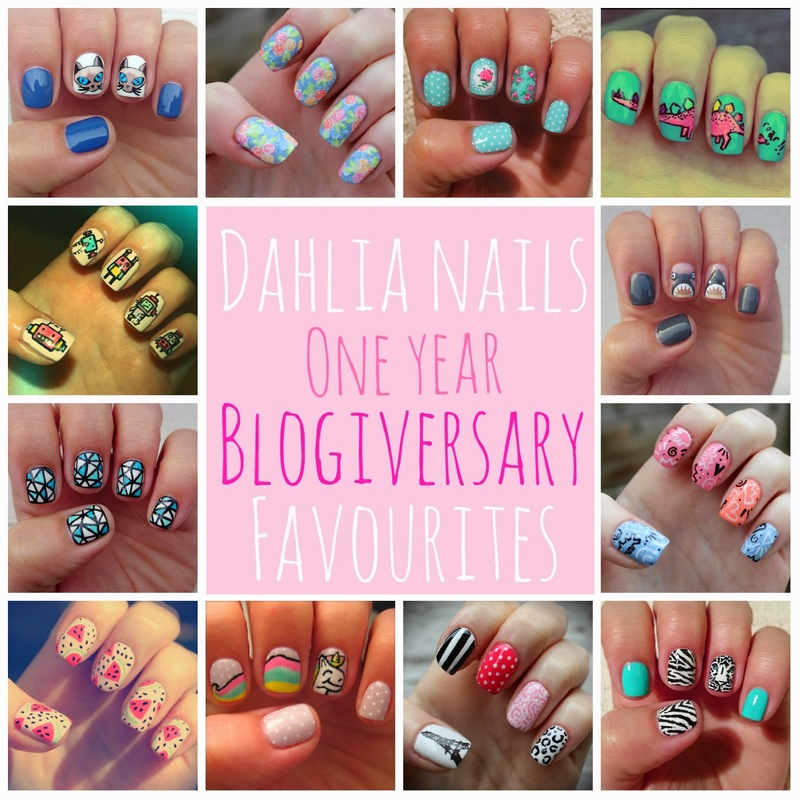 Dahlia Nails: Dahlia Nails One Year Blogiversary! We can't believe that Dahlia Nails is one year old! It feels like only yesterday that we were sat around brainstorming about names and designs, trying to figure out the right photo width and html. Now here we are, one year later and so much seems to have changed. We thought we'd look back on some of our favourite blog moments of the past year to mark our blogiversary. Hopefully some of yours are here too. Our very first post - yay! We spent a long time deciding on a name for the blog and even longer to create the first logo, social media sites, and general feel of the blog. We had both been creating designs for a little while before starting the blog so many of our first posts were pre-DN. Looking back they look so different to our nails now - we're so glad you stuck with us through the raggedy cuticles and uneven filing! One of the most exciting things as new bloggers was (and still is) getting featured by some of the brands and sites we love. The first we can really remember is Models Own's Swatched! page. It was so exciting seeing our design on a page that wasn't our own and we were inspired to try and get featured as many places as possible. We have since featured on quite a few sites including Superdrug's Look At Me, Hello Giggles, and Nail It! Mag. We still feel a buzz when we see our work spread across the interweb and are keen to focus on this even more in our second year. The texts between us are quite funny when we get to a new Instagram milestone. We are our own biggest fans - so sad, but true - so seeing other people appreciate our efforts is amazing. 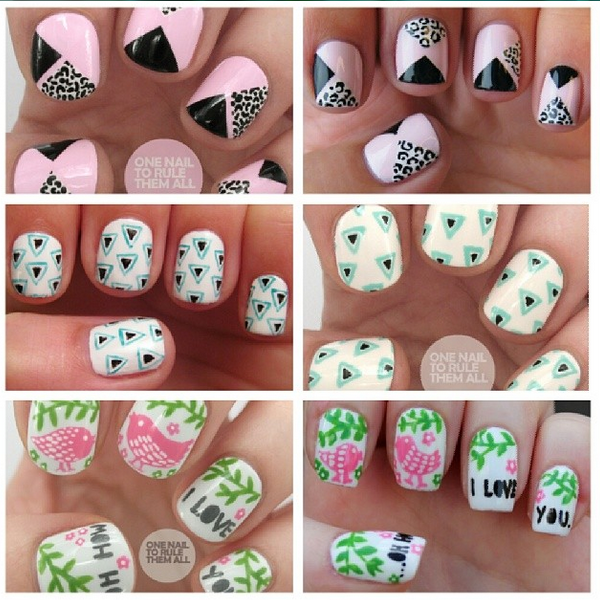 We have found the Instagram nail art community to be one of the best. There seems to be a lot of negativity on Facebook, not with us per se, just in general but on IG we have seen nothing but love. 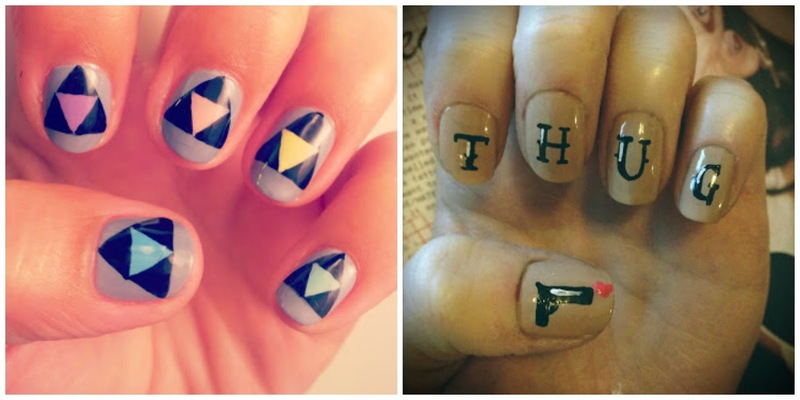 One of the best days for us was being asked by Rimmel to be part of their nail blogger program. We could've died of excitement. Rimmel is a brand that we are both huge fans of and to be asked something like this when we are still relatively small was a huge privilege. We were invited to a Coty PR event which was so much fun. We still chuckle at being troublemakers and knocking over the large nail polish props (I may have knocked them over but Jo definitely aided by making me have my picture in there - Emma). One of the best things about the event was getting to meet our nail heroes - Sammy, Allie, and Alice - we were fangirling hard at lunch with them and kind of wondering what we were doing there as they are all so amazing. Another exciting moment for us was when Barry M showed us some love by sending us some products to review. This was a huge moment for us as we had always been such huge fans of the brand. We didn't start the blog to get freebies or grab the attention of our favourite polish brands but it sure has been nice to see our manis feature on their social media sites. One thing that we have enjoyed more than anything is becoming part of a really inviting and supportive community of nail bloggers. This was something that we hadn't really anticipated when we started out but it really has been so nice reading people's comments and getting involved on social media. We were so shocked when Alice from One Nail To Rule Them All asked us to do a mani swap as she is what we'd consider one of the big guns of the nail blogging world. Although her version of our design kind of put us to shame it was so much fun picking manis and reaching a new readership. Definitely one of our blog highs. Other than ourselves we have two bloggers who consistently make us smile with their constant support: Jayna from The Sequinned Nail and Robin from Roaring Nails. Thank you girls for taking the time to read and comment on our posts - it is much appreciated! We have taken up quite enough of your time today so just wanted to say a massive THANK YOU to our readers. From the bottom of our hearts it means so much that you take the time to look at our blog, comment on our posts, and interact with us on Twitter and Instagram. What have been your favourite posts or moments from us this year? Wow congrats on the anniversary, you achieved a lot in only one year! !